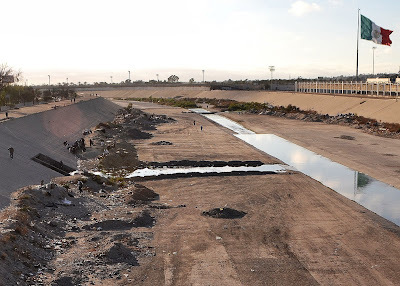 In early August, Mexico's government destroyed the encampments in Tijuana's riverbed after the notorious "El Bordo," where homeless people had been living for years, became international news. A tent city soon sprang up nearby, in Tijuana's Plaza Constitucion, and has housed homeless migrants, largely deportees, since. 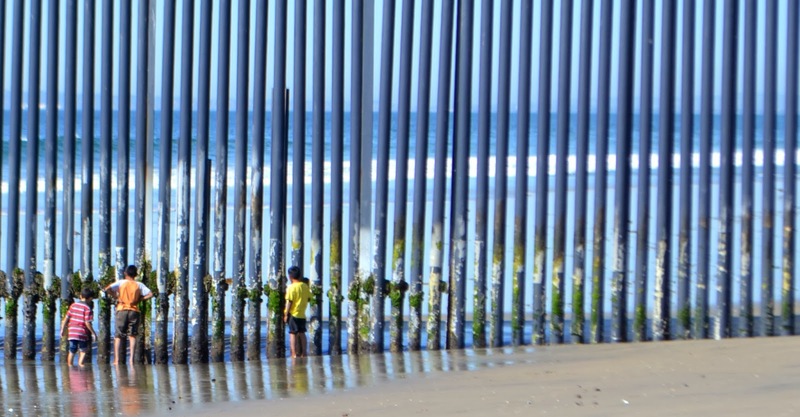 Of these deportees, almost 40 percent have lived in the United States for several years and identify as at least partly American; at least 5 percent identify as indigenous Mexican and speak very little Spanish; many need mental health care or addiction treatment, and nobody wants to be there. The encampment is administered by volunteers from Angeles Sin Fronteras, Angels Without Borders. 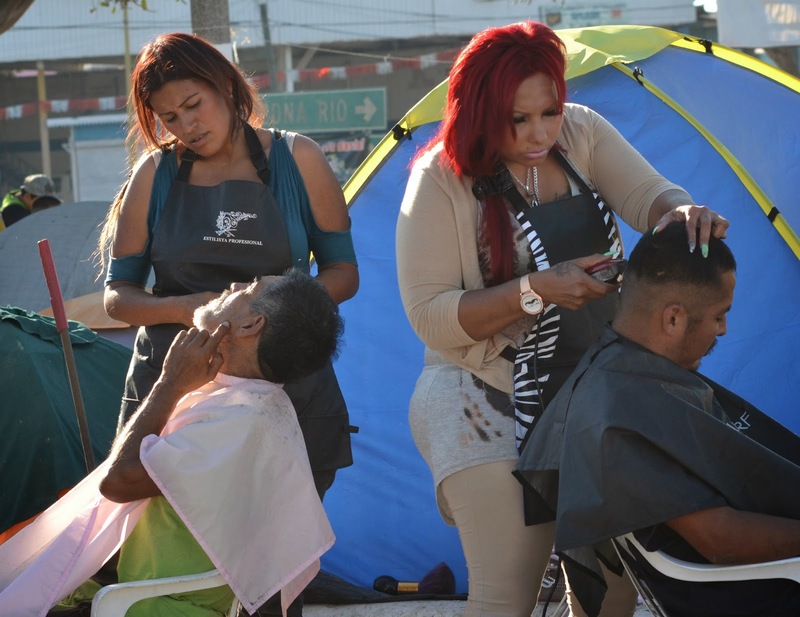 They offer food, a temporary place to stay, bathrooms and makeshift showers, and free haircuts to those looking for work. 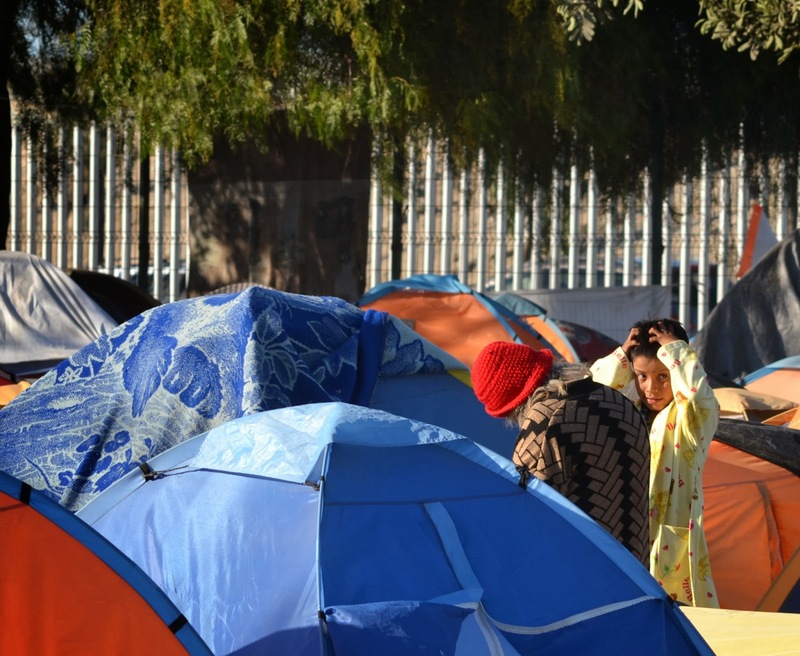 There are very few places that offer such services for the homeless and the "segun deportados," the twice deported, who have absolutely nowhere else to go. 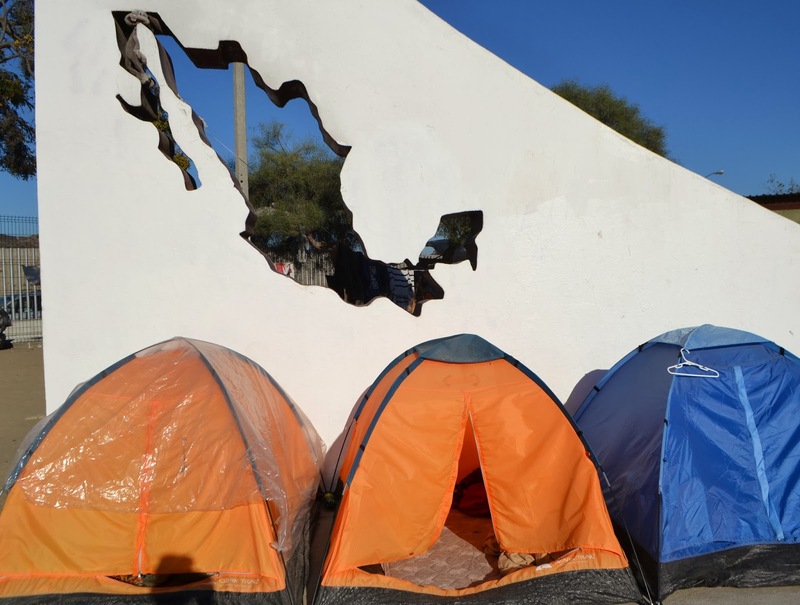 The ones that do exist subsist on very little support from the Mexican government. 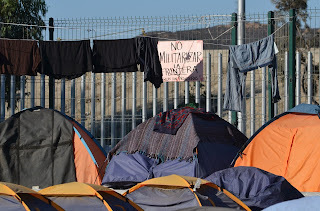 Everywhere, handwritten signs are tacked up that read: "No militarizar la frontera" - Don't militarize the border. 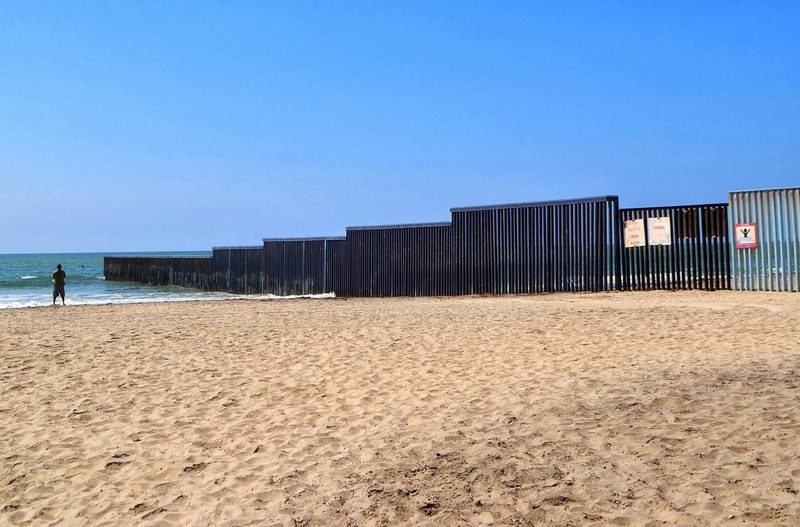 Mexico's northwest corner is a neighborhood in Tijuana called Playas. It is notable for its beautiful beaches, its American population, its seafood, and its wall. La Fronteriza begins, or ends, here. 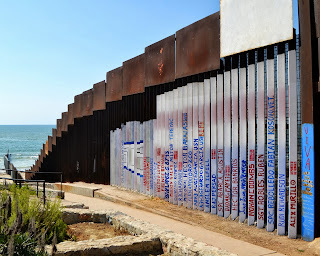 This is the border. 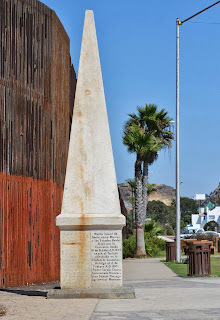 Once, both San Diego and Tijuana were seen as one region, and the two countries were only separated by a marker. It still presides over the border, and the walls curve slightly to accommodate it. 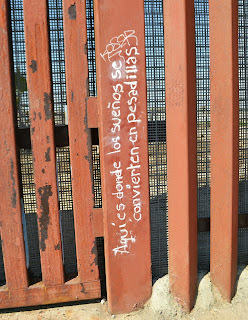 After the marker came a threadbare barbed wire fence, and then a wall. 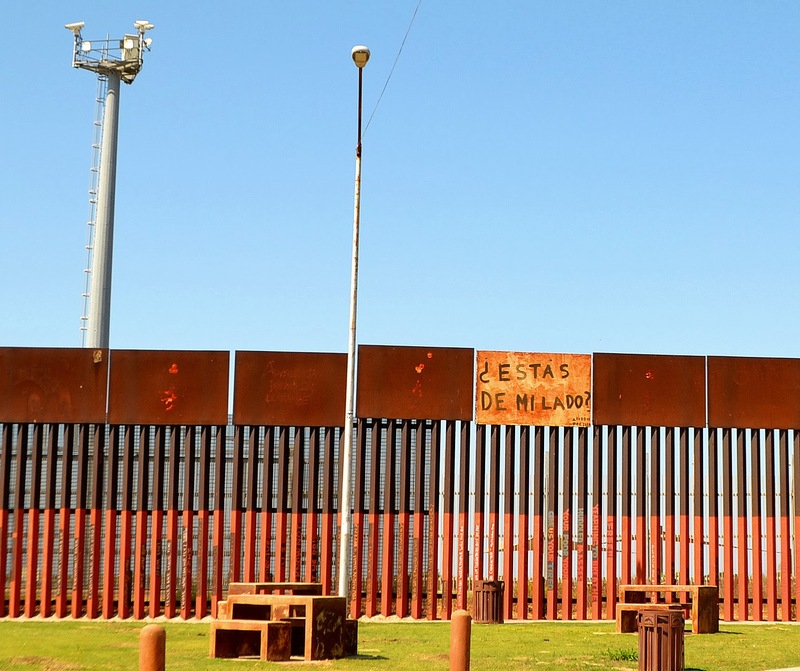 As the U.S.'s border becomes more militarized, it builds more barriers. Now at this particular shared corner of the countries, there are bars, a mesh fence, and a third fence, all of which end about a hundred yards into the ocean, crowned with a panopticon of security apparati. Beneath this thicket of cameras and floodlights is a park. Until 2009, you could go to Friendship Park and shake hands, hug, or share an international kiss through the bars. Now there is barely enough space to press the tip of a finger through the fencing. 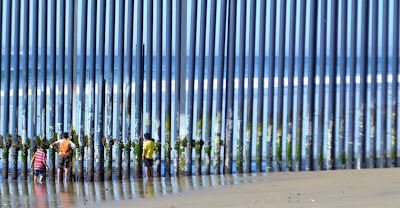 There is a system of gates by which transborder friends and families can walk into a common area and hug and hold one another under the watchful eyes of border agents, but more often than not, they remain closed. "Here is where dreams become nightmares." 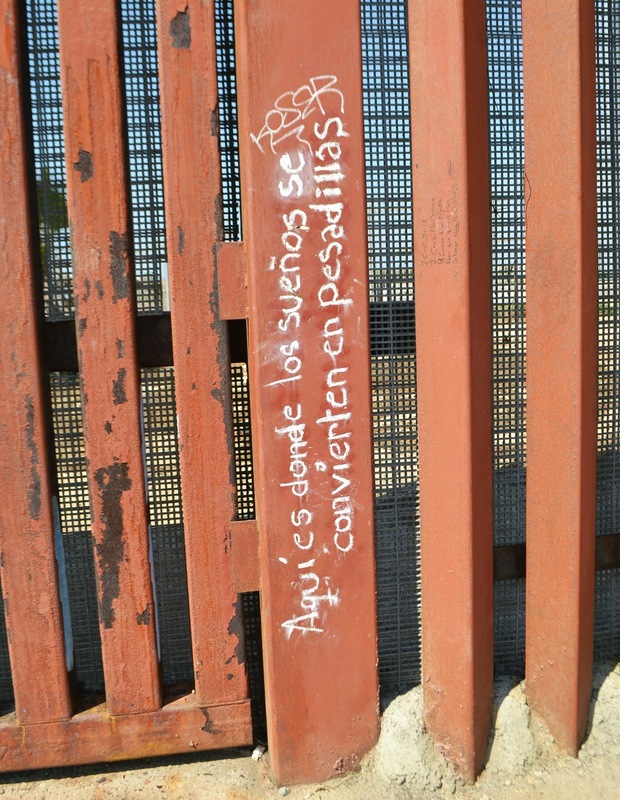 The American side of the wall is free of graffiti, but the less heavily supervised Mexican side is adorned with art, scrawled messages, and names of deportees. 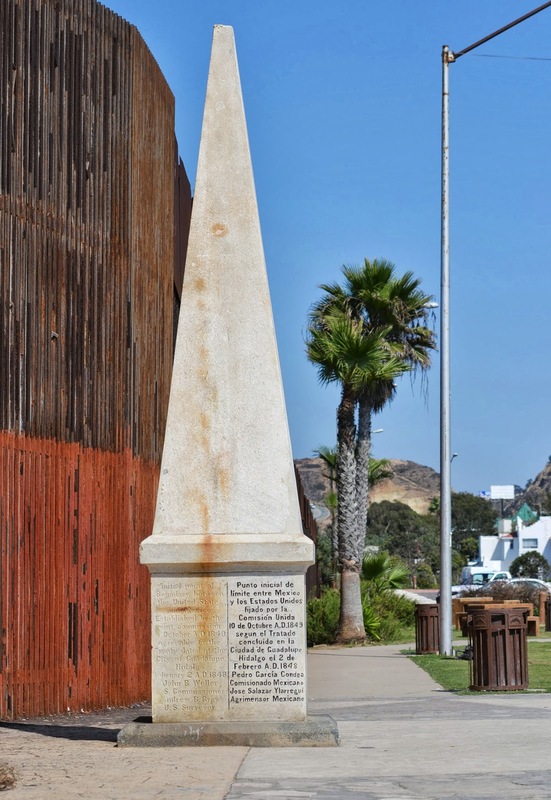 A list of names of deported veterans of the United States military. Beneath the cameras and floodlights and alongside the names, the desperately scribbled messages and phone numbers, and protest art, stands one stark question on the rusty wall: ¿Estas de mi lado? Chief Gary Harrison at the Matanuska Glacier, which has receded so quickly that grass has not had an opportunity to grow over the soil. Today is the United Nations' Indigenous Peoples' Day. 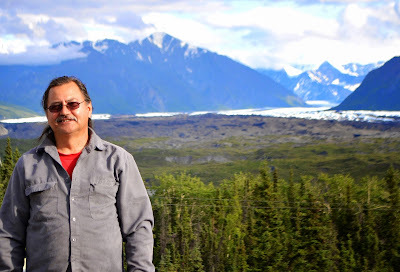 Three weeks ago, I was sitting in a cabin in Chickaloon, Alaska, with its traditional Ahtna Athabascan chief, Gary Harrison. I had traveled there to ask him about whether Alaska's indigenous people – uniquely placed – have solutions to a climate that, in the Arctic, is changing more rapidly and dramatically than anywhere else in the world. 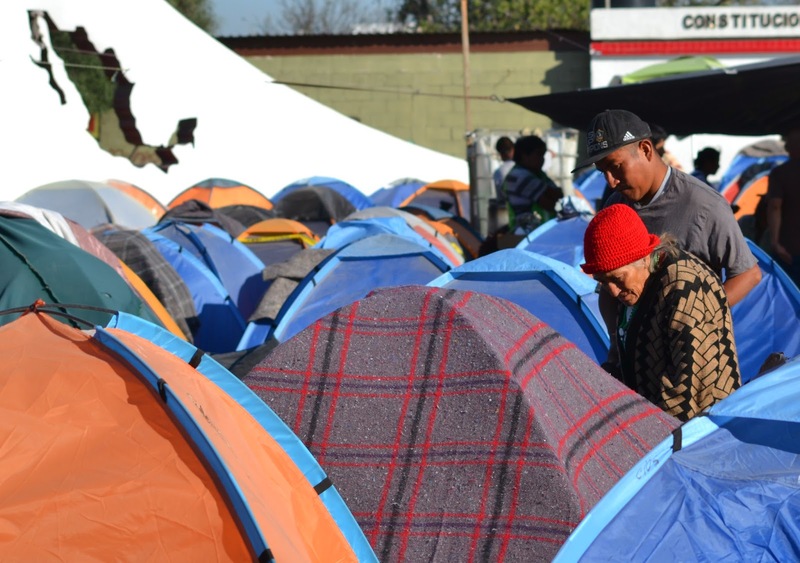 The extreme weather changes are already creating the world's first "climate refugees," people left homeless when entire villages flood out or wash away. Chief Gary, as he is called, says this is not surprising given how cavalier governments and corporations are about the world's environment. "Look at the cumulative effect of all of these things going on," he says. 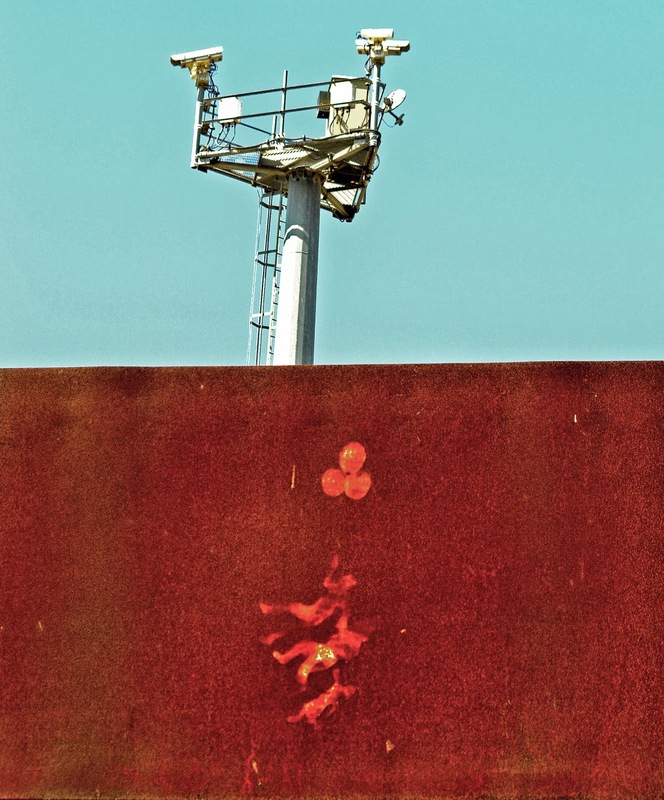 "Like the oil spills that they have out there that go basically unreported to the public, not only on these platforms but in the aging pipe systems that's crisscrossing the inlet, underneath the inlet and going to the old oil tank facility on the other side of the inlet to the now defunct refineries, and all of these leaky pipes... and you say that these things don't have a cumulative effect?" Chickaloon is a remote and beautiful village, about a hundred miles from Anchorage. 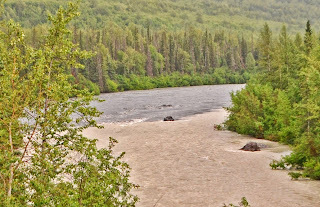 It is bounded by the Chickaloon River, which during the summer burbles merrily between homes and along the Glenn Highway. 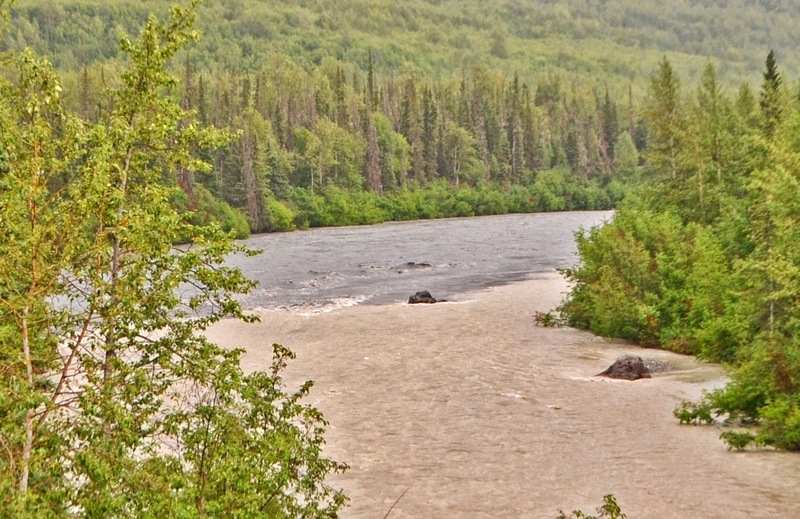 Salmon, moose, and bear are not just common sights, but essential food sources. 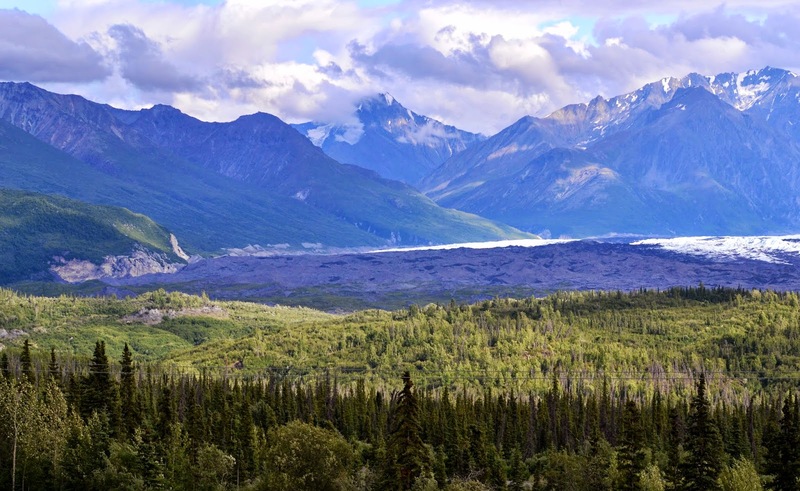 The view of this part of Chickaloon is dominated by the majestic King Mountain, on which caribou, mountain goats, mink, and Dall sheep live and forage. Most of the people here are Athabascan Natives, homesteaders, or both. Chief Gary Harrison grew up in Chickaloon and comes from a family of homesteaders. He speaks deliberately and passionately. His demeanor is quiet, even bookish. 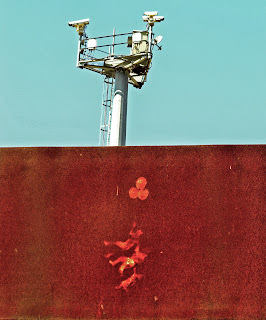 Yet what he says clearly communicates his passion for the land and his frustration at its abuses. Harrison is fighting a proposed mine in Chickaloon. The majority of people in the village appear to oppose the mine, despite the promise of new jobs and infusions of cash and economic power similar to that which briefly made Chickaloon into an important stop on the Alaska Railroad. But Harrison says these are ephemeral benefits that come with a high cost. First, he says, it will pollute at least three hundred drinking wells, which the company itself admits. And many of the people who lived there are horrified at the idea of building roads over and around the mountains, through King Mountain and Castle Mountain and the migration paths of the moose and sheep. "People who talk about 'clean coal,' that's an oxymoron," says Harrison, shaking his head. "There is no such thing as clean coal. And they say, 'well, it's cleaner than that.' Cleaner than what? Cleaner than coal from other places? Well, that's not saying much. 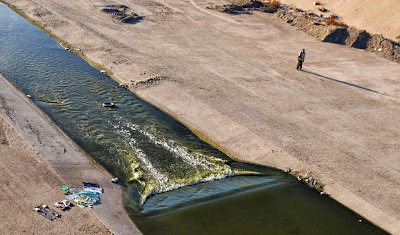 "And the fact of the matter is, they can try to clean it out of the air, it's still submitting CO2, and then they take the carbons, the sulfurs, and all of the other toxic waste that's in it, and they put it in the ground.... it then gets in the groundwater and it poisons entire cities." Harrison is also fighting the same battle on a much larger front. He is, among other things, the representative of the Athabascan Nation to the United Nations and the Arctic Council. Right now, mining is a major topic. "At the Arctic Council, we're trying to make a treaty, or a binding agreement, on short-lived climate forcers, and one of the basic things in the short lived climate forcers is black carbon. Black carbon gets on the snow, it gets on the ice, and it melts it much faster every year than ever before." He points to the Matanuska Glacier, which feeds the Chickaloon River, as an example of how quickly the climate is changing. The glacier has been receding and melting so fast that it has left miles of black soil where ice once was, fertile soil that is so new that grass has not yet had a chance to grow in it. Harrison says that as glaciers and sea ice crack and melt at an alarmingly rapid pace and the native flora and fauna die off, the only thing that can save the habitat now is traditional wisdom and ideologies, such as mutual respect, sharing resources, and looking out for the world instead of mere economic interests. The selfish people of the world made our world this way, he says, and it is up to the selfless ones to make things better. Earlier this week, Tijuana police, aided by money from Mexico's government, razed homeless encampments up and down the part of the Tijuana River known as El Bordo, or "The Edge." Today, dozens, like this man who was standing near a footbridge trying to get passersby to toss money down to him, have returned. 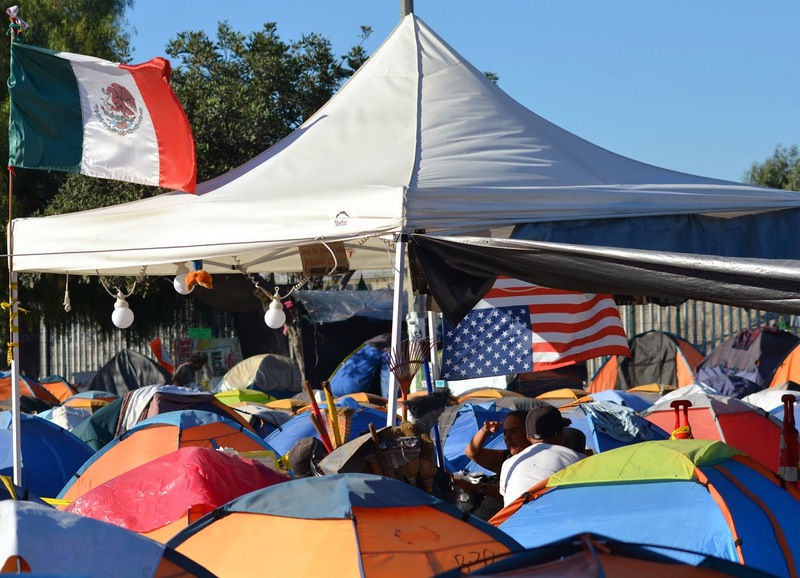 Many here are drug addicts; most are deportees from the United States, unceremoniously dumped in Tijuana regardless of their state of origin in Mexico. First of all I want to say that my heart goes out to those who were injured or killed and their families. I hold in my loving thoughts and my healing prayers all those who were and continue to be affected by the horror that occurred on Monday. I want to everything and anything I can to help. To me the Boston Marathon has always been and it continues to be, a celebration of life. It’s something that occurs every spring in Boston. It’s a celebration of the renewal of life— the daffodils poking through the earth, the forsythia in bloom. Even more fundamental than a sporting event, to me, the Boston Marathon symbolizes this celebration of life and the celebration of the human spirit and it continues to do so. Out of all the catastrophe that occurred that day what was really inspiring, and what we need to look at and take with us, is the love and compassion and empathy that spontaneously emerged from all the people there. Each and every person was a hero— the runners helping other runners, the spectators helping the injured, the police, the doctors, the nurses, the volunteers along the course, the National Guard, the Boston Athletic Association officials— everyone spontaneously worked together, without anyone telling them what to do, just worked together to help those who were injured and to help anyone in need. 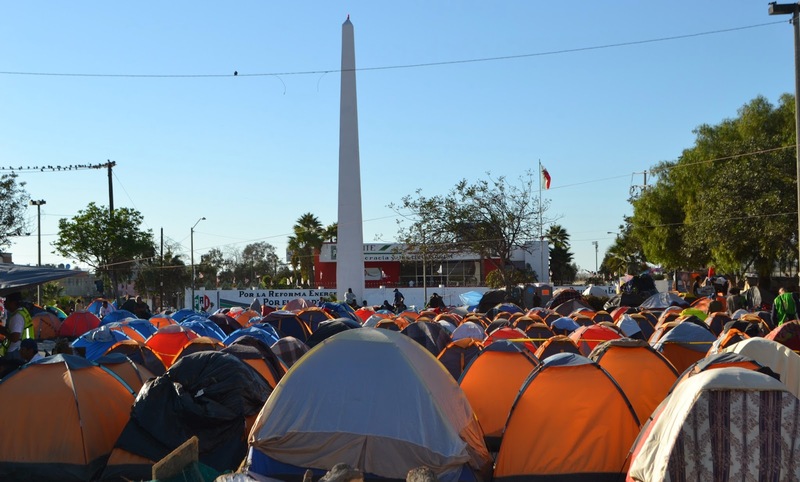 Thousands of runners were stranded without any money, warm clothes or keys. And what happened? People spontaneously took off their own jackets and gave them to the runners and took them into their homes and gave them beds and money and clothes and food. No one told them to do this; it was a spontaneous outpouring of love and I believe that this what is fundamental to human nature. This is what we’re all about as human beings. This is what it is to be American to work together for the common good, to help each other. This is the fundamental premise of any valid ethical, moral or religious system— to do for others what you would have them do for you, and to do it spontaneously and with love, and to treat your neighbor as yourself. And that’s what we saw on Monday, that’s what the 99% is all about. This other stuff is pathology…. It’s something gone wrong. Just as we’re all capable of getting cancer, we’re all capable of getting emotionally, spiritually, mentally or physically sick and that’s what we’re seeing in a very small percentage of the population who are acting out of a mistaken belief. It’s a dysfunction and we need to find a way of healing it, of stopping it, and of finding and dealing with people who would do us harm. The security forces, police, FBI, and all the people who cooperated to help, exhibited intelligence and heroism in doing what needed to be done, quickly and efficiently and our gratitude goes out to these dedicated men and women. And now it is up to us to carry on and to continue to reaffirm what is real in the human spirit, that is, love and care and empathy and this human ability to work together to help one another, to do what needs doing in the face of violence, greed, perversion and all the things that would divert us from the true nature of what it is to be human. From around the world come messages of love, caring, sympathy, offers to help, from all countries of the world and it is this spirit of friendship, and love and caring that we need emphasize and to continue and to strengthen. This is really what we need to take away from the horrific events on April 15th. Thank you for giving me a chance to say what I think and feel. My heart goes out to everyone, here and around the world, with love and gratitude for the goodness of the human spirit, even as I feel great sadness for the hurt, pain, suffering and death of the victims and their families. The Boston Marathon is on everybody's lips this week, of course. I in no way want to downplay the extent of the loss and pain that people felt, but feel that the story of Bobbi Gibb deserves to be out there. Gibb lives part of the year in San Diego, where she went to school, and part of the year in Massachusetts, where she was born. I first heard about her in passing last year, and, curious, looked her up. 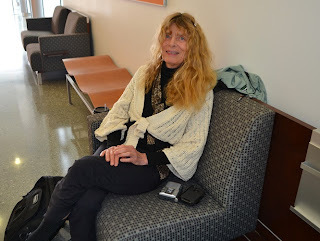 Once I found out that she lived in San Diego, I asked her to meet with me to do an interview so I could profile her. She has never really sought the spotlight, but she is very accessible. It turned out that she works at the Salk Institute, just across the street from my school, so we met in a café and talked for hours. She is a lively, fascinating, and engaging speaker; it was difficult, writing her profile, to winnow down the information to the best quotes. Gibb first saw the Boston Marathon in 1964. Her father had taken her to see the runners at the marathon, and she fell in love, deeply and irrationally, and immediately began training. The conventional wisdom at that time was that women would damage their bodies if they ran more than a mile and a half, but she knew she could do it, so she ran a little farther each day, waiting to collapse or for her ovaries to fall out, until she was running thirty to forty miles a day. "I was very strong," she said. She applied to the 1966 marathon, but her application was rejected by the Boston Athletic Administration because they were unwilling to take on the liability of a woman runner. That is when her plan formed. She hid in the bushes at the start of the race, slipping into the pack after the gun went off, and finished ahead of two-thirds of the men. She was young, beautiful, and fast, and her story made international headlines. Gibb was grand marshal of the parade this year, along with the first winner of the officially-sanctioned women's division race in 1972. That meant she was at the race's finish when the bombs went off. "Horrible," she texted me, because the phones weren't working in those awful hours after the explosions. "It was horrible. My heart goes out to the victims and their families." What should have been a triumphant and happy day was forever marred by those explosions. But that doesn't mean that her story should disappear under its weight. Bobbi Gibb was and remains a hero to those who challenge the status quo. At nearly 70, she looks and seems much younger, and she's still running every day. I ran four miles with her just before she left for Boston, and could only keep up with her through sheer force of will. Here is the text of the story. Bobbi Gibb found one of the great loves of her life in her early 20s. Gibb, who was born and raised in Massachusetts, already had been running for as long as she could remember. As a child, she would run out into the woods, pausing to rest under trees, count clouds and commune with nature. The Boston Marathon, then the best-known marathon outside the Olympics, was more than simply an elite race to her. In fact, to Gibb, the marathon wasn't a race at all -- it was a joyful annual ceremony. What Gibb didn't know was that she wouldn't be allowed to compete. She was born in 1942 and came of age during a time when women were supposed to want nothing more than to stay at home and be housewives, and they certainly never did anything as unseemly or potentially sweaty as running. Gibb knew about the social pressures, but had no idea that the Boston Marathon was actually closed to women until she sent an application in 1966 from San Diego, where she was attending UC San Diego. By then, she had been training for the marathon for two years. She had also been waiting during that time to see if something horrible would happen to her physically, because the conventional wisdom of the time was that running more than a mile and a half was potentially deadly to women. She pushed herself more and more, until she was running 40 or 50 miles a day in her clunky nurse shoes. “I got a letter back from Will Cloney [then the director of the Boston Marathon] that said women are not physiologically able to run marathon distances, and we wouldn't want to take the medical liability. Gibb said that running was more than something that simply gave her happiness at that point. 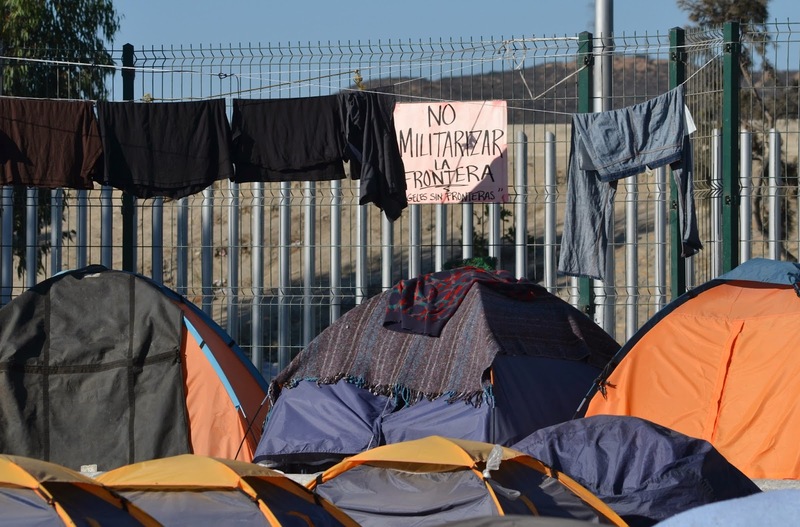 It was also an escape, the only way she could escape the anger and frustration she experienced daily at being bombarded with messages that she was weak, irrational, stupid and a secondary citizen. “You can't be who you are. You can't do what you love, because you belong to a certain class of people that we consider inferior. So you're inferior, and you can't do this. ‘It's for your own good! It's for your own good, dear,’ ” she said mockingly. Then she realized she had been given a brilliant opportunity to change things -- not in a huge, overarching way but in a tiny way that could have an enormous effect, and in the best way she knew how. Gibb would run the Boston Marathon, application or no application, feminine inferiority or no feminine inferiority. She spent nearly a week on a bus to get from San Diego to Massachusetts and when she got there the day before the 1966 Boston Marathon, she announced her plan to her parents, who thought she had suffered a break with reality and was suffering from delusions. Her father stormed out of the house, but Gibb managed to convince her mother to take her to the starting point of the marathon. She borrowed an old pair of her brother's Bermuda shorts, put on a swimsuit and a hooded sweater over it, laced on her running shoes, and went with nervousness and great anticipation to crash the Boston Marathon. She ran with the pack of men until she heard the comments from behind her, and realized the men behind her had figured out she was a young woman. It had taken about 30 seconds. She knew they could easily shoulder her out or report her, so instead of ignoring them she turned around and smiled. To her surprise, delight and a little chagrin, the crowd of men welcomed her. At this point, Gibb recalled, she started to get hot. She wanted to take off her sweatshirt, but knew her body and long bright blonde hair would give her away to the judges, the crowd and everybody else. She took off her sweatshirt and the crowd went wild. Reporters quickly figured out that a woman was in the race and started phoning ahead; a local radio station started broadcasting regular updates about where “the girl” was in the race. As Gibb ran by the crowds, she saw their reactions. Men were cheering and clapping, and women were jumping wildly up and down and weeping. “I thought, “Oh my God, this is incredible,’ ” Gibb said, her voice warming. “This is really blowing peoples' minds. I mean, women didn't know they could do this!” She finished ahead of two-thirds of the marathon runners, dehydrated and exhausted. Of course, change didn't happen all at once. 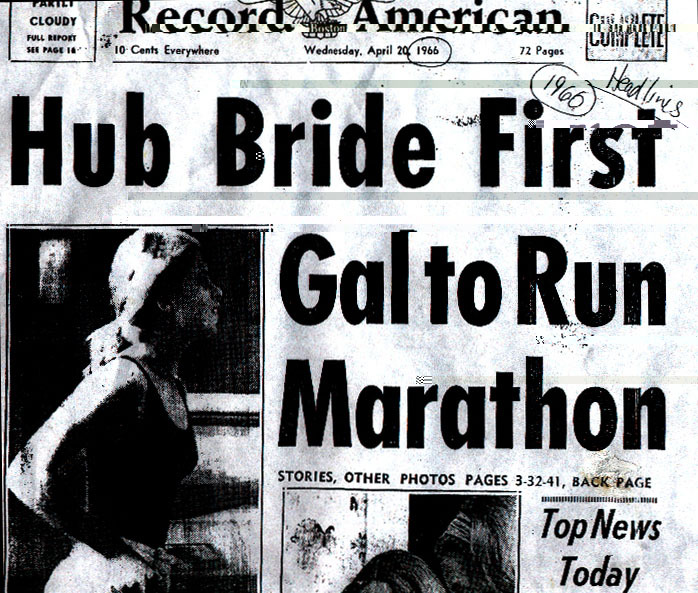 “HUB BRIDE FIRST GAL TO RUN MARATHON,” trumpeted one headline. But little by little, more women came. 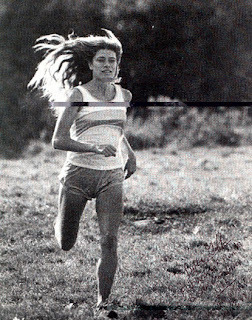 Gibb ran the next year, as did a second woman, Kathrine Switzer. The year after that, Gibb ran the marathon again, with several more women. She applied and was turned down for medical school, went to law school instead, became a lawyer, pursued her art, had a baby, wrote a book, changed careers (she now researches neuromuscular disorders for labs in San Diego and Boston. and just finished writing a second book) and through all that she kept running. 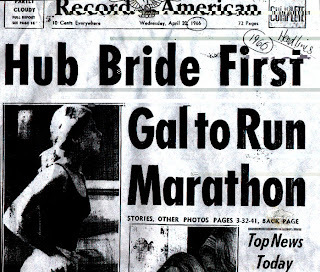 In 1972, six years after Gibb first ran the marathon, the Amateur Athletic Association changed the rules so that women could run in an officially sanctioned race in Boston. The rest is history. Gibb is still as lithe and lean as the 22-year-old who ran that first race. She now splits her time between San Diego and Massachusetts, and she never stopped running. She hopes to train for the 2016 Boston Marathon, where she will run to celebrate the 50th anniversary of the time she took her first steps down the long path to equality.